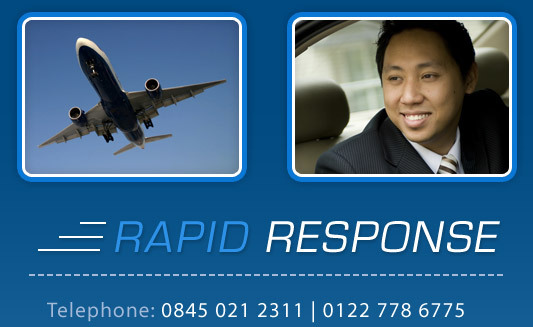 Airport Cars & Rapid Response (Established 1984) are committed to providing the highest levels of customer service for business and leisure travelers, individuals or groups of up-to 65 passengers, any vehicle…any distance…any time!!!! Operating from Heathrow/Gatwick/Stansted/and London City Airport. Services include “meet and greet” and Group transfers around UK with friendly experienced chauffeurs. We specialize in Mercedes cars, 5-6 or 7 seater Mini-vans and Motor coaches. We provide a superior wedding service for bride, groom and wedding guests. Impeccably dressed chauffeurs working from a fleet of Luxurious vehicles ranging from vintage cars to Mercedes/Rolls Royce/Lincoln Limousines & up-to 65 seat Motor coaches. We charter a wide range of vehicle for all occasions I.e. Golf ,Horse racing , Football and other sporting events. We also cater for the Film and television Industry. Vehicles are available for hourly, daily ,weekly or even monthly charter.